Home Good Deals Cross Country Cafe Wacky Wednesday Coffee Sale! *BIG NEWS* We are thrilled to announce that we have extended our Wacky Wednesday sale, your can now enjoy great pricing on delicious coffee for an entire week! Yes, that’s right, the famous Wacky Wednesday coffee sale is now the Wacky Wednesday Weekly coffee sale! 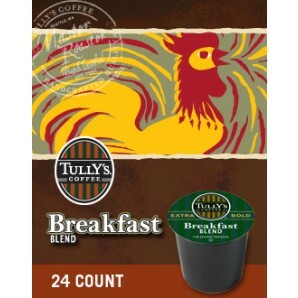 Tully’s Breakfast Blend extra bold Keurig Kcup coffee is on sale for $11.99 per box of 24 for an entire week! This aromatic masterpiece wakes the senses with vibrant floral and delicate sweet tones. With 20% more coffee than regular K-Cup portion packs, Breakfast Blend is an extra bold coffee that is sure to be a perfect start to your morning. Twinings Chai Tea Keurig Kcups are on sale for $9.99 per box of 24 for an entire week! Fine black tea perfectly balanced with more of the sweet and savory spice flavors of cinnamon, cardamom, cloves and ginger. The sale ends Tues., Aug. 27th at midnight EST, and don’t forget shipping is always free on orders over $59.00!